The first and probably last all-ski musical ensemble ever to exist, the Ski-A-Delics were formed in Boston in during the depression of the late eighties and quickly became that region's signature sound of the time. 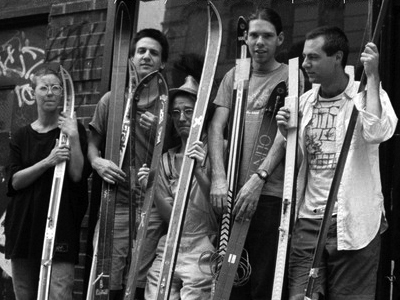 The five members of the group, Greg Wildes, Jonathan Sahula, Patrick Donnelly, Laura Burns, and Ed Osborn each played a ski equipped with a single string. Though they had between them fewer strings than are found on an average guitar, the group never bothered to keep them in tune yet still managed to produce full rhythm and melody lines simultaneously. With their chaotic and often scarcely-memorable performances the group gained quite a following and performed internationally. For many years their recorded output was very hard to find: a pair of near-legendary cassette releases (emphasis on "near") never made their way online. However their earliest recording, "Snow Bunny Bobby Katz," recently surfaced on vinyl and digitally via Platinum Metres in Hong Kong.